This is intentionally an aggressive looking anti climb system. 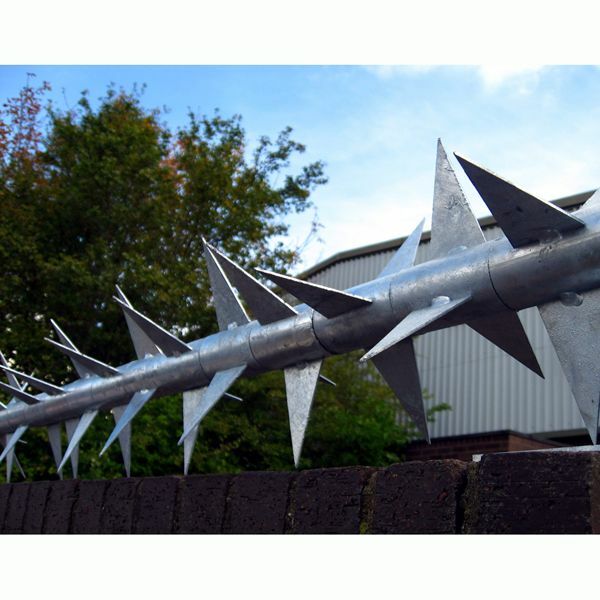 It`s designed to be mounted on wall or fence tops to deter unwelcome intruders from climbing into your grounds or onto roofs. The system comprises a series of spiked collars, each featuring 3 protruding spikes welded to a central collar. These thread onto a central spindle which is supported at intervals by a choice of brackets. The system which is manufactured from galvanised steel, is normally supplied with the natural galvanised finish, however if preferred, it can be supplied with a luxurious paint finish. Note: Restrictions may apply to use of this product in some locations, and of course warning signs must be clearly displayed where it is used.